Cruises depart approximately every 30 to 40 minutes. 10.20 to 16.20 (April to October). 10.20 to 15.40 (November to March). The cruise is most enjoyable between April and October due to warmer weather and less rain. We are comparing Thames River Cruise Hop On Hop Off Prices from leading ticket suppliers and Try to find you Cheap tickets prices on the market. The 24-hour Hop-On Hop-Off bus ticket is basically your key to discovering the central sights of the British Capital without the need of a strictly organised tour or irritating time restriction. Instead this convenient transport pass lets you choose which sites to see and when to see them. 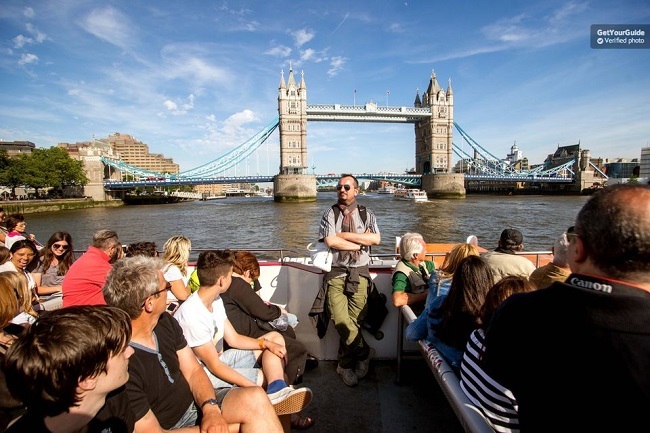 You could even choose to stay aboard and ride the entire loop listening a knowledgeable tour guide describe the city’s most significant sights and explain the complex development of the city of London. Right for people who want the convenience of a self-guided city tour, the Hop-On Hop-Off city cruise allows visitors to make their own itinerary and explore the city at their own pace. Great for families with children as well as disabled visitors, you will be able to see a lot of the city without taking an organised tour. This is also a good option for people who are looking to combine sightseeing with scenic cruising in the city centre. Your Experience With Thames River Cruise Hop On Hop Off? Enjoy the freedom that the Hop-On Hop-Off River Thames Boat service gives you. Benefit from the gentle breeze and pull of the River Thames, away from the hustle and bustle of London’s busy streets. Join any of the Hop-On Hop-Off boats at any of the designated stops throughout the city. Take some time to photograph the Houses of Parliament and The London Eye as you float by and learn about Tower Bridge and other famous architectural works from a professional onboard guide. Pass by major city landmarks such as the Shakespeare’s Globe Theatre, the Millennial Footbridge, H.M.S Belfast and much more. What Thames River Cruise Hop On Hop Off Includes? 24-hour ticket to the Hop on Hop Off Thames River Cruise. Live onboard commentary (in English). Sight you will see on the Hop-On Hop-Off Cruise. Plan your trip in advance and pick out the right attractions and you will be able to use the Hop-On Hop-Off boat as your main mode of transport in the city of London. (This will be much more pleasant than taking the busy subway. Travelers Reviews about Thames River Cruise Hop On Hop Off? Travellers on TripAdvisor have said that the Thames Hop-On Hop-Off river cruise is well organised and a great way to explore the city. Comments indicate that the staff are very helpful and polite and that the onboard café has a good selection. On Get Your Guide the tour has an overall rating of 4.4 out of 5 from over 600 reviews and on Viator the cruise has an impressive 4.5 out of 5-stars. Hop-On Hop-Off River boats have wheelchair access. Tickets are accepted in printed or electronic form. You will receive your confirmation via email. Your ticket will be valid for use any time within a 24-hour period. Tickets purchased from Get Your Guide are refundable up to 24 hours in advance but tickets purchased from other ticket providers are non-refundable and you will be charged the full price of the ticket. Departure times may vary depending on river traffic and tides. No foods or drinks are included in the Hop-On Hop-Off ticket price, however, there is an onboard snack bar and café where you can purchase food and beverages. The London City Cruises Office is located on Victoria Embankment, SW1A 2JH, London. Duration: The duration of a one-way cruise between Westminster and Greenwich is approximately 1 hour. Duration: The sightseeing tour by bus lasts as long as you choose within 48 hours. Duration: The London Eye makes the full circle in half an hour. Duration: The duration of the tour is approximately 7 hours.